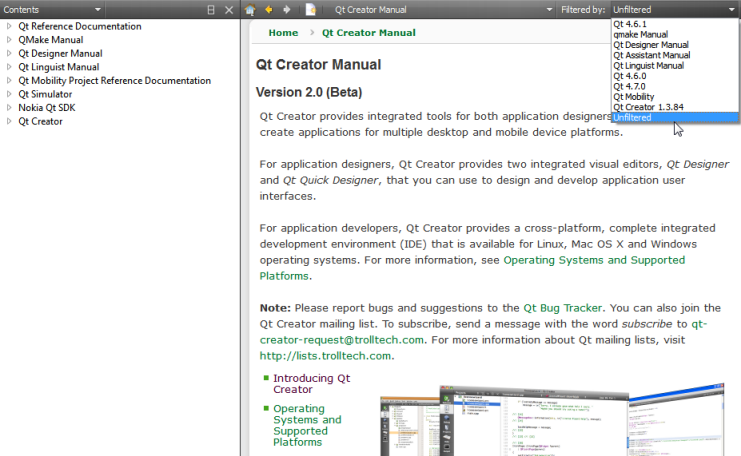 Qt Creator comes fully integrated with Qt documentation and examples using the Qt Help plugin. To view documentation, switch to Help mode. 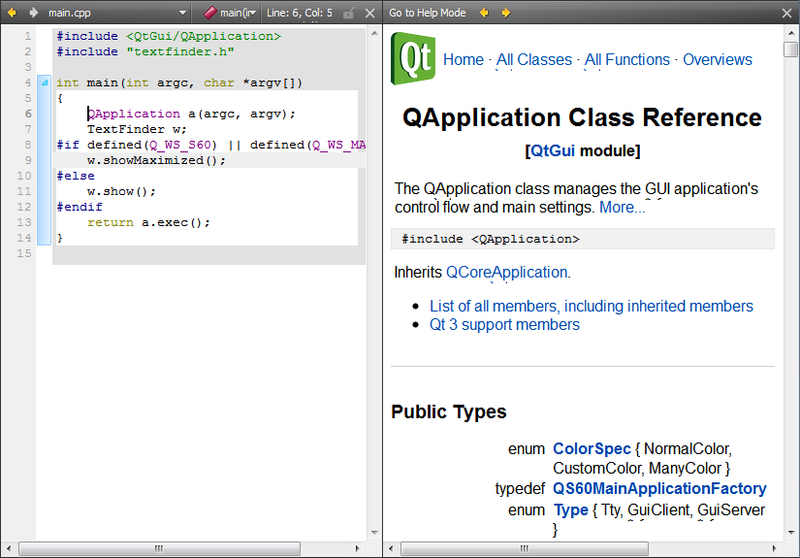 To obtain context sensitive help, move the text cursor to a Qt class or function and press F1. The documentation is displayed in a pane next to the code editor, or, if there is not enough vertical space, in the fullscreen Help mode. To select and configure how the documentation is displayed in the Help mode, select Tools > Options... > Help. Create a .qch file from your documentation. For information on how to prepare your documentation and create a .qch file, see The Qt Help Framework. 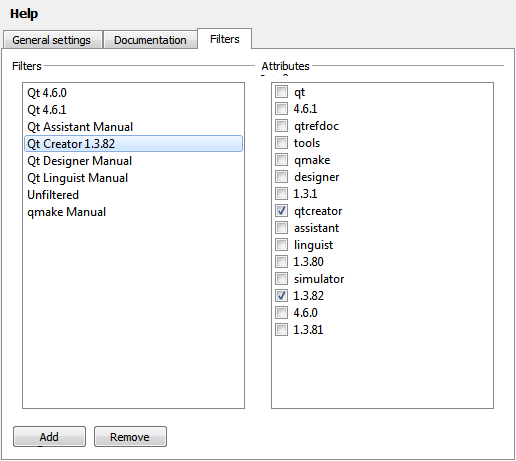 To add the .qch file to Qt Creator, select Tools > Options... > Help > Documentation > Add. You can filter the documents displayed in the Help mode to find relevant information faster. Select from a list of filters in the Filtered by field. The contents of the Index and Contents pane in the sidebar change accordingly. You can modify the filters to include external documentation, for example, or you can define your own filters. To construct filters, you can use the filter attributes that are specified in the documentation. Each document contains at least one filter attribute. If several documents contain the same filter attribute, such as tools, you can use that attribute to include all those documents. Select Tools > Options... > Help > Filters > Add. Enter a name for the filter and press OK. In Attributes, select the documents that you want to include in the filter. In the Help mode, select the filter in the Filtered by field to see the filtered documentation in the sidebar. To modify filters, select a filter in Filters, select the attributes, and then click Apply. To remove filters, select them in Filters, and click Remove.